My mother was describing the last wreath I made to a friend, and that friend said she'd like 3 for presents for people for Christmas. 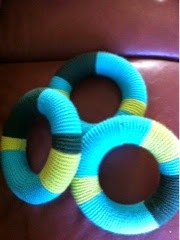 Here they are without any embellishments. And with all the bells and whistles! I love the style of these. Traditional but not fuddy-duddy. My mother wanted a handmade gift to bring to a friend in the UK. 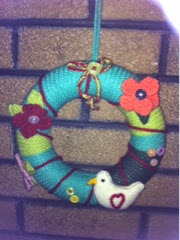 This wreath is from 'Twas the Knits Before Christmas' by Fiona Goble. 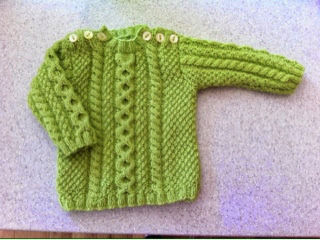 It was a fun knit, and great for using up oddments. It's a Coraline and Wybie update. 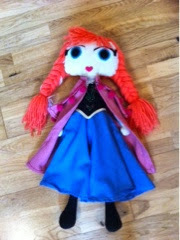 Now I just have to make Coraline's coat and put some Velcro on Wybie's coat. I thought I'd done a few posts over the last week, but obviously not. Whoops! 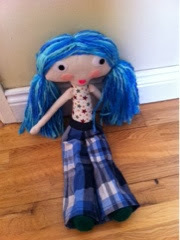 I had someone contact me through Facebook about making a Coraline doll. Obviously I said yes !!!! 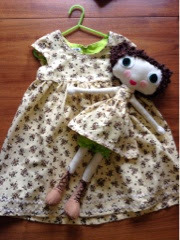 I've used my large rag doll pattern for the basic body and just changed the legs so that it would be easier to dress the doll as it was requested that she have removable clothes. 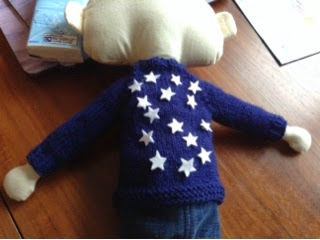 This is a picture of Coraline with her not-quite-finished star sweater. 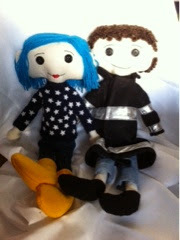 And here is Coraline again with her best friend Wybie. 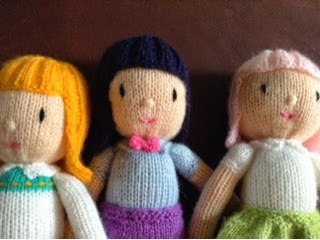 I just need to find the right black buttons for the eyes so that I can do their faces, and then their hair. And lastly, Coraline's yellow rain coat. On a bit of a go-slow this week as I have a really bad cold. It's just one big snot-fest. Yuk! A friend asked me to make cake toppers for their wedding last weekend. 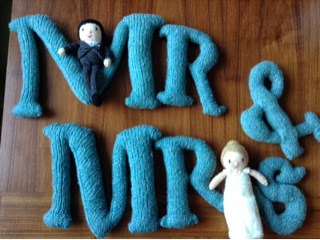 While I was at it I made a knitted Mr. & Mrs. Probably the most complicated thing I've knitted! It was fun though, and a good challenge. Winding up a hank of Kilcarra Donegal Tweed this morning. No fancy winders in this house! 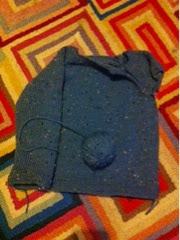 I'm knitting a top-down jumper for Oliver (Tama by Kelly Brooker). 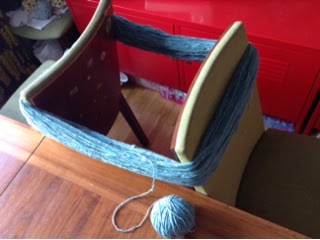 Running kinda' low on wool now for the last sleeve. Just hope I have enough left! I don't tend to crochet much, but I took a notion to make a toy so I'm mid-make now.I find I have to concentrate so much and I'm always counting! 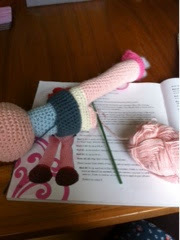 The hardest part with this toy is trying to crochet parts when some of it has already been stuffed. 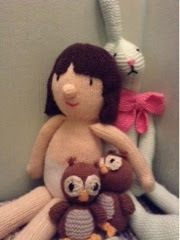 As you know, I tend to knit toys flat, then seam them up. It's a learning curve. Monday is back to school for my kids and with Oliver starting playschool it's going to free up a few hours for me in the mornings. Oh my gosh, what a week! Oliver was sick Tues,Wed and Thurs night, vomit and diarrhoea.And Emily was sick We'd, Thurs and Fri night.Weirdly they were both fine during the day, just very cranky from lack of sleep. And up at 6 every morning. 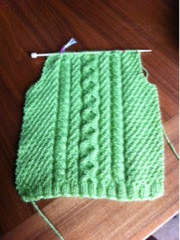 I did get a little bit of knitting done - finishing the Irish leprechaun jumper. This is going to my cousin over in Australia who just had her first baby. Hopefully she'll like it. A work in progress at the moment, but I'm liking how it looks. 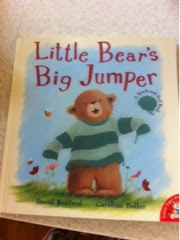 We got this lovely book at the library.bits a really sweet story about two brother bears and their favourite jumper. 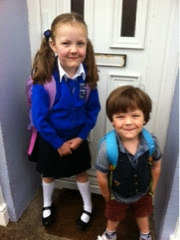 At the end their mother knits them matching jumpers so they can each have one. It kinda makes me want to knit matching jumpers for my two. 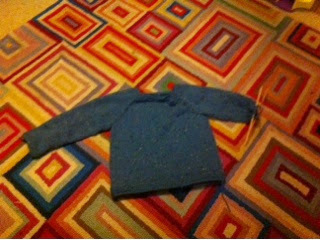 The only problem with it is that at the end the mother knits their two matching jumpers in one night. That kind of sets quite a high expectation for kids. My two are always very impatient while waiting for me to knit something for them. It was obviously not written by a knitter! My arm is hurting this evening. 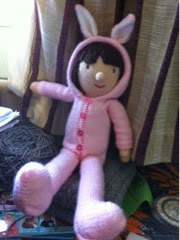 Too much knitting I think! So while I take a break, and watch the World Cup, I thought I'd share a pic of the newest design I'm working on. One of my cousins has a daughter the same age as Emily and even though they live a good few hours away from us, the girls always get on great when they meet. 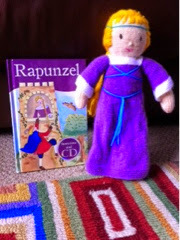 For her birthday I got a book of Rapunzel, and decided to knit a little matching doll. I'm quite pleased with how it turned out! I used my free Lilly pattern as the base. 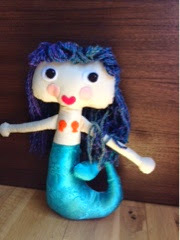 I've wanted to make a mermaid doll for a while now, so yesterday I drafted up a pattern based on my larger rag doll pattern.I used nice shiny green fabric for the tail. 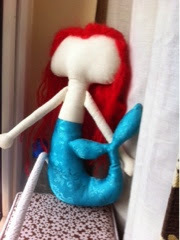 Then Emily suggested giving her red hair so she'd look like Ariel from The Little Mermaid. 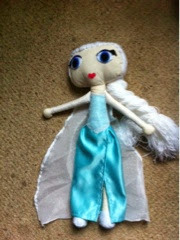 Now she just needs a face and some embellishments to finish. 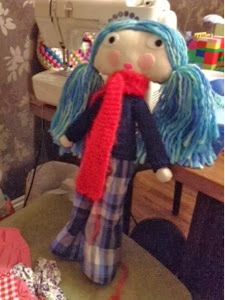 A friend requested a small rag doll for a baby present. It has the baby's name embroidered on a bib to make it extra personal. 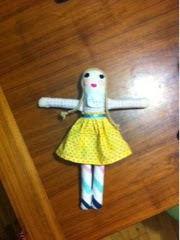 The new pattern is finally typed up, double-checked, and up for sale. Phew! 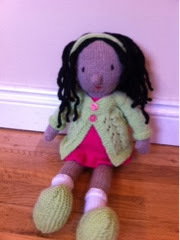 For sale through the Ravelry link above for 3euro. 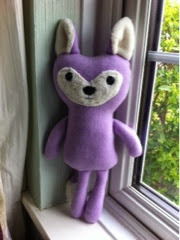 Also for sale through my Etsy shop, but not as an instant download as the file is too large due to the photos. I just have to refine the pattern on the computer and then I'll have the pattern I promised before Christmas up for sale. 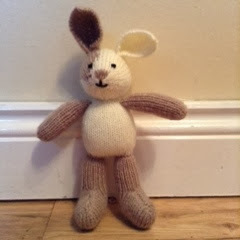 Finally got some time to knit my Little Cotton Rabbits pattern. 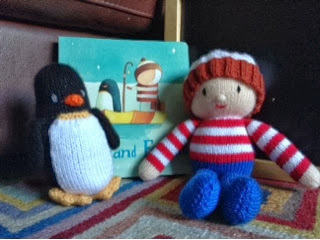 It's smaller than I envisaged but that did mean that I managed to get him knit in a day. 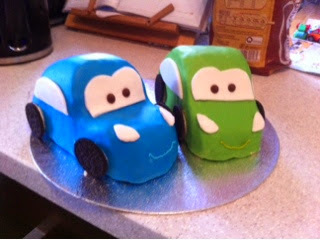 It's for my new nephew who was born just before Christmas and has got no gift yet - oops! 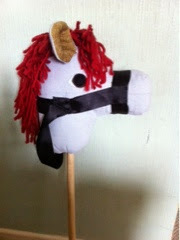 They're calling over this morning so I've no time to make the clothes but he still looks cute without them.